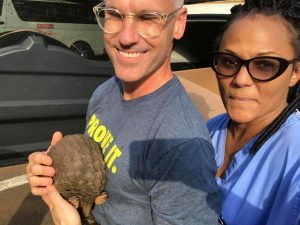 Today we met our first pangolin, brought to the hospital campus to be sold, most likely for stew meat. The pangolin is a small, scaled mammal that looks a bit like an armadillo. They are one of the most trafficked mammals in the world and are protected under national and international laws. 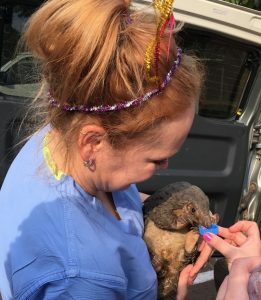 Not unlike some of the human visitors to Duside, this pangolin, accompanied by a confident adult, seemed very unsure of what the day might hold. 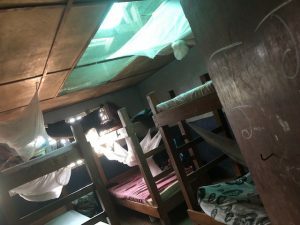 Fortunately for the children at Duside, what lay in store was a small amount of discomfort in exchange for a significant step toward a better life. The sting of an IV was followed by the elimination of a hernia or the restoration of the body’s normal anatomy. The pangolin was not facing such a fair transaction. This spurred a debate amongst several team members and visiting embassy members. 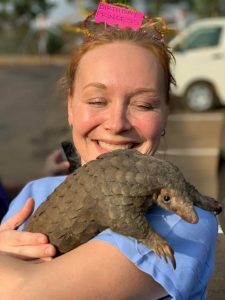 A proposal arose: What if we pay the $10 (the going rate for 3 pounds of fresh pangolin), drive it a few kilometers past the gate, and return it to its bush home in a tree? 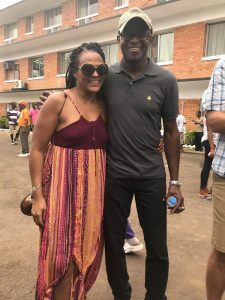 “No, that’s not the official stance on endangered edible animal management in Africa,” one of the embassy members pointed out. That practice risks encouraging more pangolin trafficking. The philosophical conundrum got me thinking about the parallels in our week’s endeavors. Sure, springing the pangolin may not stymie the hunting of her species or even affect her type’s declining numbers. But spending the liberating $10 would be a life-altering action for her. The same philosophy applies to our work here. 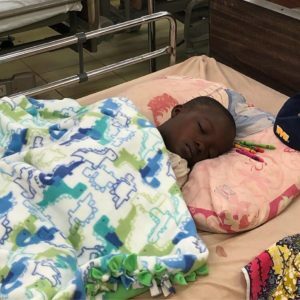 Our seemingly small CSI presence may not change the existence of viruses like Ebola that can make an orphan of a 12-year-old within 72 hours. 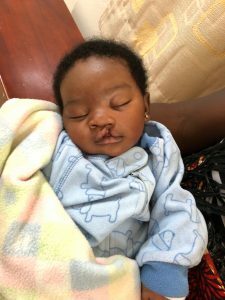 Nor can it change the fact that thousands of children are born with maladies that go untreated because they can’t access care. 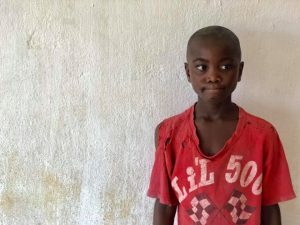 But for the 12-year-old orphan (who not only lost both parents to Ebola two years ago but also had lived his whole life with a giant hernia) and the other 90 children who had surgery this week, our presence ensured that tomorrow would be better than yesterday. 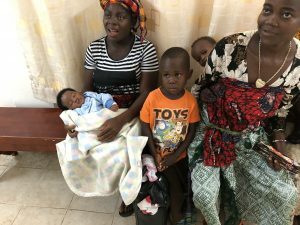 And maybe, with the new skills and knowledge of our Liberian colleagues, we helped improve access to care for years to come. 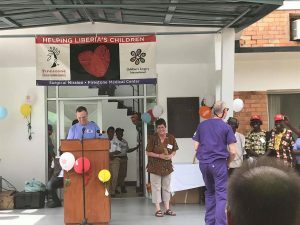 At the celebration today, as 250 Liberians and Americans gathered to express mutual thanks, I think everybody was arriving at the same conclusion: You may not change the world, but you can make somebody smile, help somebody feel better, make somebody feel safe — and that makes for a good day. 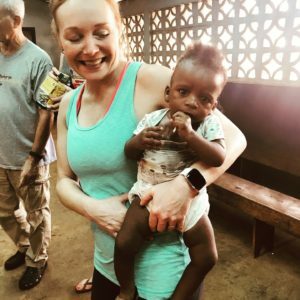 Check out more photos from Liberia here! 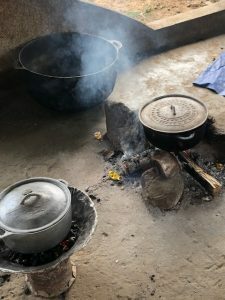 The day starts early at the Firestone Liberia guest house. If I listen closely from my room above the dining hall I can hear the staff at work on our breakfast by 4 a.m. There are eggs to crack, bacon to fry, pancakes to grill, and fruit that won’t cut itself. The food here is delicious, and I eat too much. We are on the bus by 6:30 a.m. Some days I can see Venus in the west as we leave the guest house. We lose the sky to fog as we drive inland, winding our way through the rubber plantation to the hospital. By the time we reach the hospital, daylight is full and the air is warming. My day starts off with a bustle as I gather supplies for the cases I’m assigned. I check the oxygen supply (twice), make sure there is anesthetic in the vaporizer and more at hand if needed, and prepare the drugs for the nerve blocks that I’ll perform once each patient is asleep. 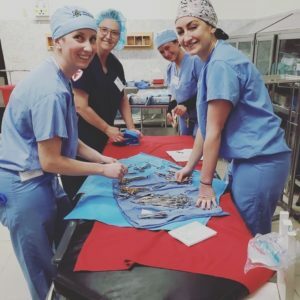 We have 25 surgeries scheduled for the day. 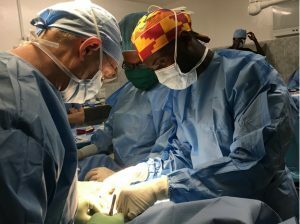 General surgeon Dr. David Andrews spends time in the OR helping a Liberian colleague polish his surgical technique. 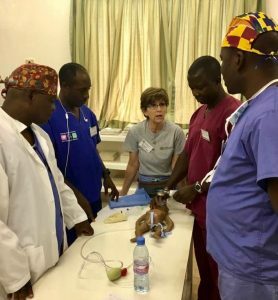 Midday, CSI nurse educator Dody Barr takes a break from her work in the pre-op area to present a lecture on newborn resuscitation. After work, it’s back to the guest house for dinner and relaxation. Dinner is on the table at 7:15 and we are finished eating by 8. The staff cleans up and does what prep they can as we will all be back at it again in tomorrow. Doing, teaching and learning. That’s our day, and we are grateful for it! 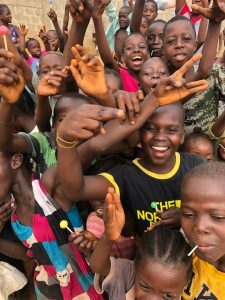 Click here to see more photos from Liberia, 2019. 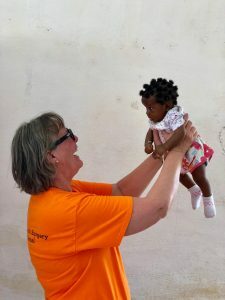 When our logistics coordinator asked for volunteers to write a blog post, my hand shot up. Not surprising to those of you who know me – I’ve always got a lot to say. I want to start this blog by saying that today was the first day I actually saw a couple of puppies walking around the hospital! I suppressed the urge to pet them, or even take one home in my carry-on bag. Reflecting on my busy day in the OR, many amazing thoughts and memories put a smile on my face. 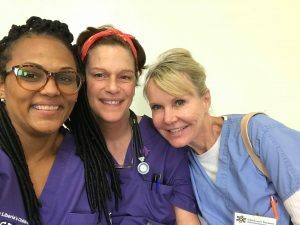 Watching CSI’s two newest OR nurses spread their wings and fly solo with minimal assistance astounded me. I look at Emily Butcher and Monica Hooley and marvel at their enthusiasm and motivation. I know they will be hooked on CSI for life, just like I knew I was on my very first trip. 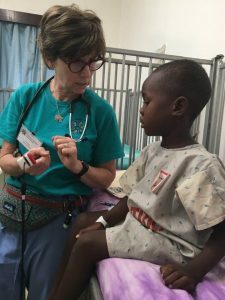 I am amazed at how universal OR nursing can be. 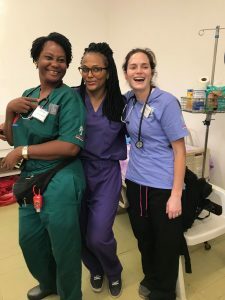 The Liberian nurses are phenomenal at helping with our room turnovers – or should I say – table turnovers, as there are two tables in each of our ORs. I want to tell you about Jackson. 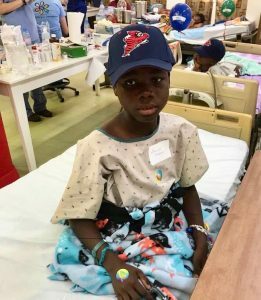 The details of his story are not completely clear to me or his pediatric urology surgeon, Dr. Janelle Fox. What we do know is that 16-year-old Jackson suffered a serious pelvic injury in an accident. 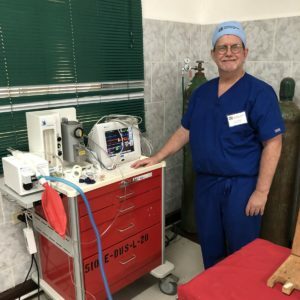 As a result, he has lived with a suprapubic catheter for almost an entire year. 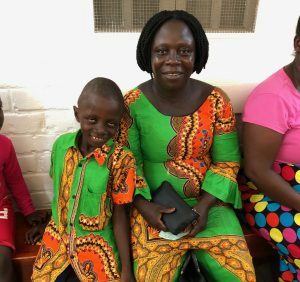 Jackson has been living away from his family, staying with family friends who have more medical knowledge. 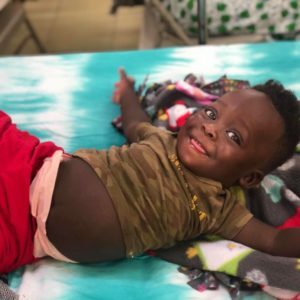 Yesterday he underwent a life-changing surgery that will allow him to urinate in a way most men take for granted. 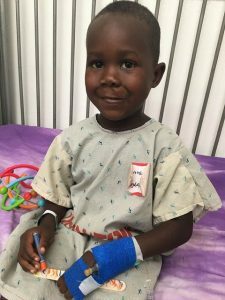 What is truly incredible about Jackson’s situation is his bravery and determination. 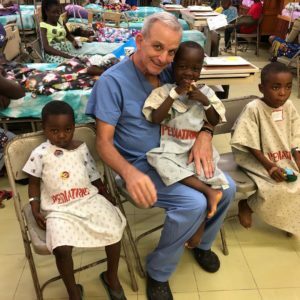 As he came into surgery I noticed the OR staff remove his shoes and take them from the room. Normally we would hand them to waiting family members, but Jackson had no family accompanying him. The shoes would wait for him outside the door. I was really touched. 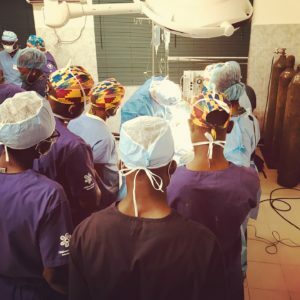 Here was a young, stoic man who was going into surgery without any loved one near to offer him encouragement or support, yet he made sure he was properly prepared for surgery and signed his own surgical consent form. How completely remarkable and mature. 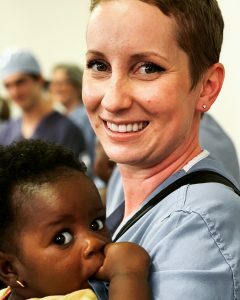 I am proud to have been able to serve Jackson, and all of our incredible patients here in Liberia. View lots more photos here! Full disclosure: Today’s blog is written by a urologic surgeon. Feel free to gloss over as much as necessary to remain in your comfort zone. 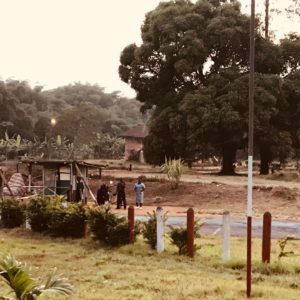 As the sun still struggled to meet the horizon, a team of motivated CSI members arose around 5 a.m., strapped on headlights and left the Firestone Guesthouse where we reside. Why? To run in the 80 degree, 100% humidity environment and to enjoy one another’s company. (Writer of this blog was soundly sleeping, BTW.) These CSI team members reflect the spirit of our mission: teamwork, sacrifice and hard work. They support and encourage one another along the way as they climb the Liberian hills in the dark. They are rewarded by a magnificent sunrise and the ensuing endorphin rush. 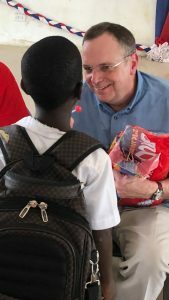 It is a blessing to return to Liberia for the seventh time. As “frequent flyers” we have built strong bonds with our local colleagues. 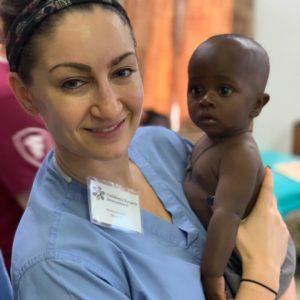 Within minutes of arrival at the hospital and the Firestone facility, we were able to reconnect and plan our work to help the children of Liberia as if we had never left. The support we receive from Firestone and the local community is invaluable. 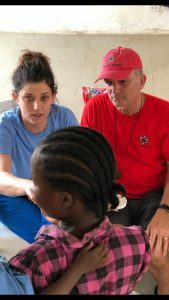 The Liberian and Firestone communities provide us with the food, shelter, transportation and facilities to do this work. 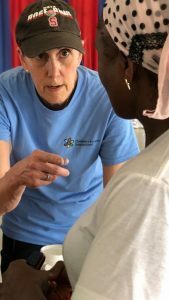 They prescreen patients, house patients awaiting surgery and provide dressings and other supplies necessary for us to be successful. Thank you, Firestone! Reconstructive pediatric urologic surgeons perform staged surgeries that are completed over a number of years. 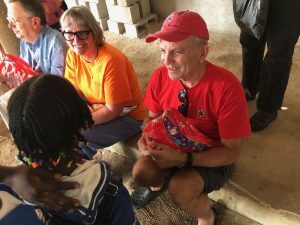 So each year we return, we see the results of our prior trips and diligently work to restore these children to their full potential. Today, we had a return visitor whom we first met in 2012 following a traumatic injury to his bladder. 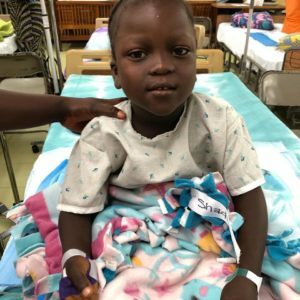 At that time he was not able to urinate at all and had been living with a constant indwelling tube extending from his abdomen that drained his bladder. 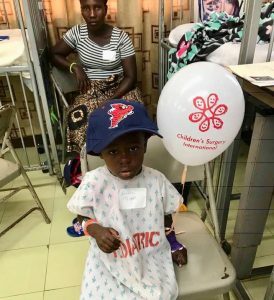 We performed a Mitrofanoff procedure (presumably the first ever in Liberia), allowing him to live a normal tube-free life. He returned today, as a healthy, productive 27-year-old man! We started the day with rounds to evaluate yesterday’s surgical patients, and all were doing well. 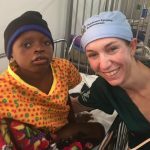 Dr. Janelle Fox performed a urethral reconstruction in a young man who could not urinate because of a traumatic injury. 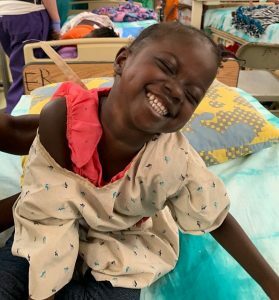 Dr. Dave Andrews continued to save the world “one hernia at a time,” and Dr. Eric Moore was able to remove a disfiguring tumor from the head of a beautiful young girl. The day was capped off by the families of our patients singing and dancing in gratitude. It was impossible to leave with a dry eye. It is impossible not to love this place and these wonderful people. xxxoooo, Liberia! View more photos in our Liberia Flickr album. 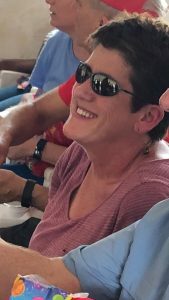 One aspect that makes traveling with a CSI team so wonderful is everyone’s willingness to dig in and do what needs to be done. 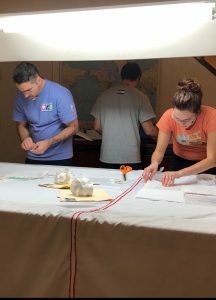 Despite being exhausted after a busy first day of surgery, Dr. Eric Moore, Ashley Dingmann, RN and Ethan Moore (pre-med student at Colorado College/Eric’s son) all pitched in after dinner to print and apply labels on multiple pages of 26 charts for tomorrow’s surgeries. It was not necessarily a fun task at the end of the day, but it was an important one nonetheless and was made easier with additional hands. 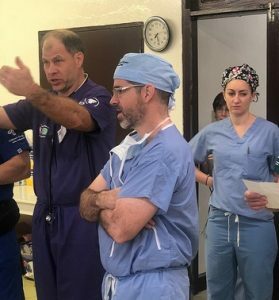 At least 15 new patients walked in amid all the surgeries today, and Clinical Lead Lora Koppel gave each one her thoughtful review, determining which team member should be consulted and how to proceed. Surgeons collaborated to maximize efficiencies in the ORs. 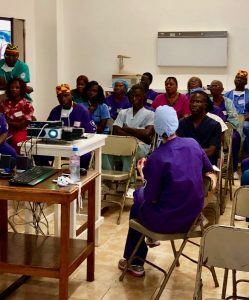 Dr. Janelle Fox gave a urology lecture to a room full of Liberian physicians and nurses. It was a productive first day! 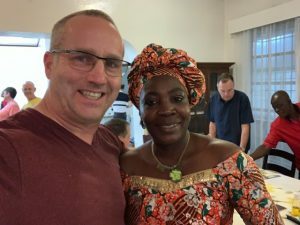 We are grateful to the many Liberian volunteers who help make this week a success. 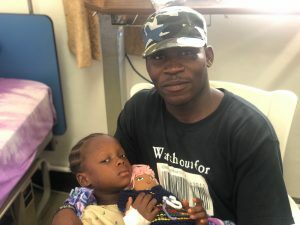 Melvin Wonyenene is volunteering for the first time this year. 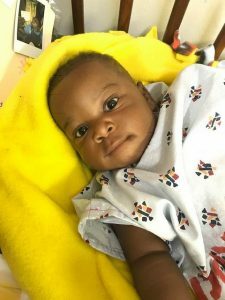 He was encouraged and touched by the surgery CSI performed for his nephew previously. 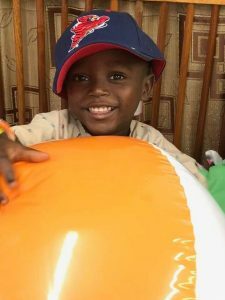 Melvin hit the ground running, and his eager attitude landed him the job of inflating all 47 of the soccer balls our fans donated over the past year. Thank you, Melvin! It is end of a very busy day. 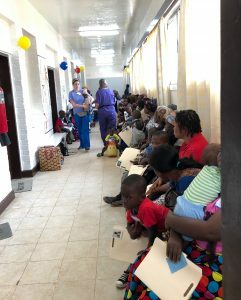 We screened 90+ patients and currently have 78 scheduled for surgery. 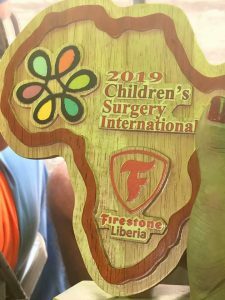 Our four CSI volunteer surgeons — Dave Vandersteen and Janelle Fox (urology) and David Andrews (general pediatric surgery) and Eric Moore (ENT) — will be performing surgery this week, as well as teaching local surgeons and residents. 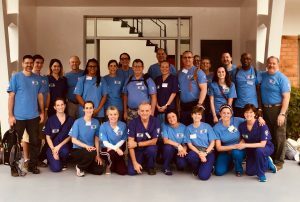 Many of our patients from 2018 have returned for follow-up or for the second phase of their urologic surgery. Screening day started off with making a medical record for each potential patient. This was done by Jim Koppel, Ethan Moore and Micki Klearman — all first-time CSI mission team members. 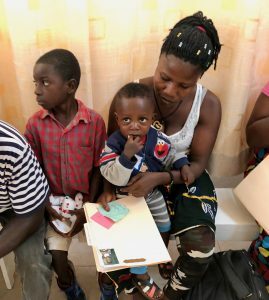 Basic information was gathered, and photos were taken before the children and their mother/father/auntie were directed to see the appropriate surgeon. Patients were assessed, and if they were a good surgical candidate they were then seen by our nurses to check weight and vital signs. The last step is to see one of our pediatricians, Drs. 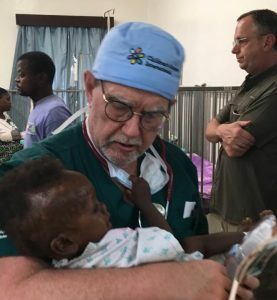 Dave Tetzlaff and Jesse Hennum, to make sure the children are healthy enough for surgery. 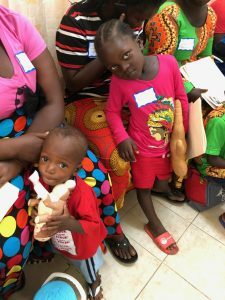 The Firestone Duside physicians, led by Dr. Wollor, have done a thorough job of prescreening potential patients during the year before our arrival. Parents and patients wait all day until everyone is screened and the surgeons create their semifinal schedules. Parents are so thankful that they jump up and down when the schedule is read. 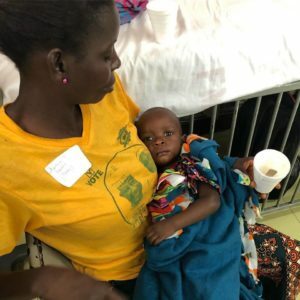 The patients and a parent are able to stay on the Firestone hospital campus — sleeping and eating free of charge until their day of surgery. 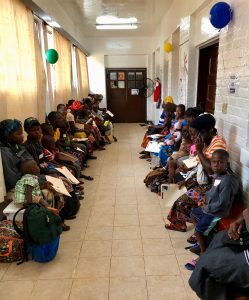 Unfortunately, as always, we had to turn away patients as our schedules quickly filled up. 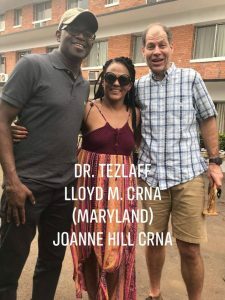 We do our best to either have the surgeries performed by in-country physicians or to keep the patients’ contact information for our next trip. 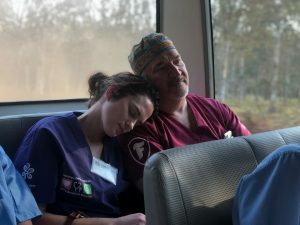 The team is tired after a busy day, but we are excited for the week ahead as we will be performing life-changing surgeries on many deserving children. 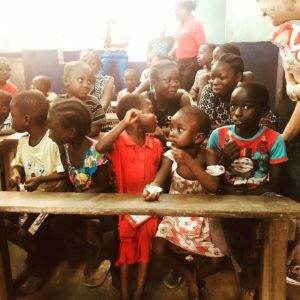 View our entire photo album from Liberia here. Today the entire team acclimated to our new environment here in Africa. 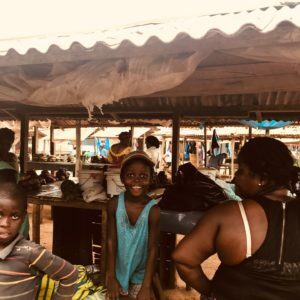 We enjoyed a lunch presentation from those who live and support health in Liberia, visited an orphanage and shopped in the local market in Harbel. 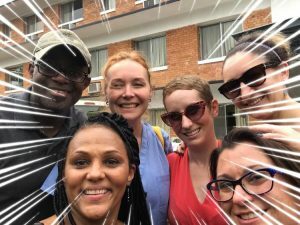 We learned more about the inner workings of the Liberian health organization and the access to health care for the Liberian people. 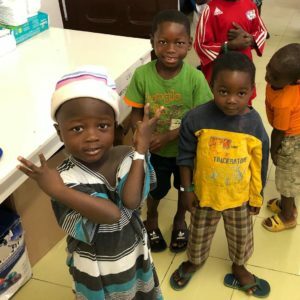 Our trip to the orphanage gave us the opportunity to see how the children are raised, provide deworming pills and play some games with the children. 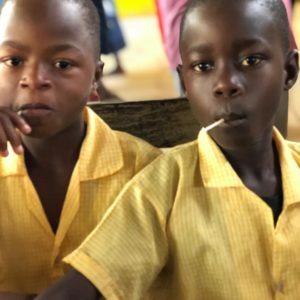 The children are educated at the orphanage and may advance to the community school when they are ready, while continuing to live in the orphanage. 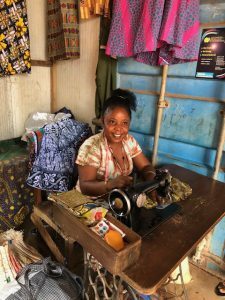 At the Harbel market we were pleased to find a seamstress and learned that sewing increases women’s economic state in Liberia. Each of today’s activities allowed the team to obtain vital information for our work and build strong relationships. 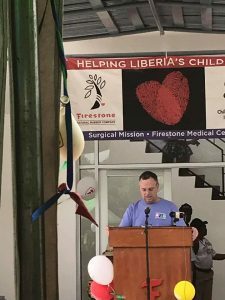 We are a team of 25 CSI volunteers, plus several key partners from Firestone Natural Rubber here in Liberia. We all ended our day with a team meeting to plan for meeting our patients and families at screening tomorrow. 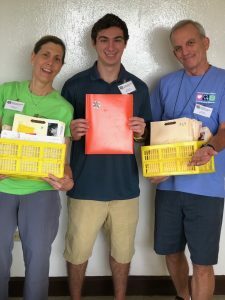 It was a full day for the advance team of eight CSI volunteers, plus Don and Janet Darden from Bridgestone/Firestone and the invaluable Firestone drivers, cooks, guides and security folks. 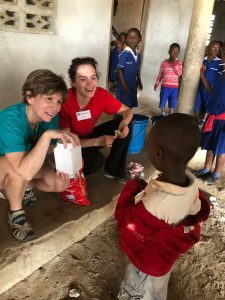 We went to five schools/community centers to administer an oral medication used to treat and prevent intestinal parasites. 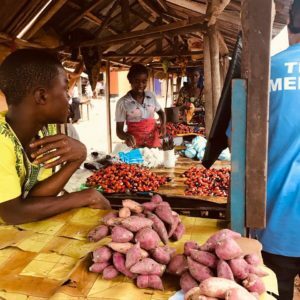 These parasites pose a significant public health problem in developing countries like Liberia. 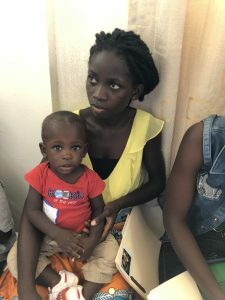 The affliction affects a large percentage of children and causes significant health problems such as malnutrition, poor growth and even learning difficulties. 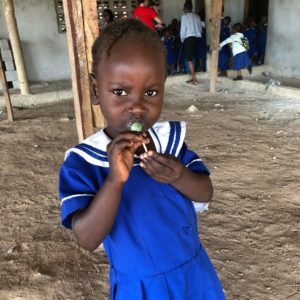 We distributed deworming pills to about 2,000 children, and everyone who received the medication also got a Dum Dum sucker to help the medicine go down! Tomorrow we meet and treat more of the glorious, amazingly photogenic, and patient children of this wonderful country. 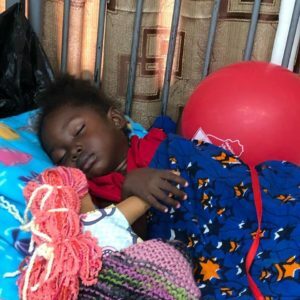 We have enough medication (and Dum Dums) to treat 5,500 children. 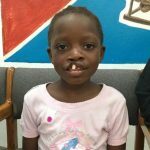 We can’t wait for the rest of the CSI team to arrive late tomorrow night to begin evaluating children for the surgical phase of our trip. 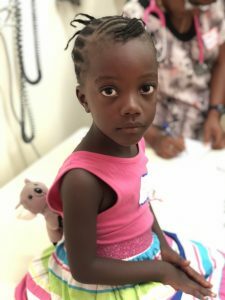 Thursday was the last full day of surgery on our Children’s Surgery International mission trip. Tomorrow we will pack up, have a celebration ceremony and start heading for home. 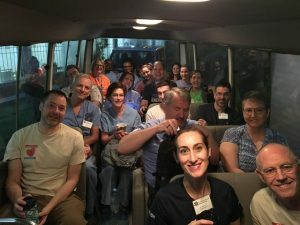 It’s been a successful trip, with more than 100 surgeries, 11 seminars for local nurses and doctors, and lots of hands-on teaching by the surgical team. The pictures are dramatic, but there’s way more to the story. You might notice in the after photo that Catherine was eating applesauce and was being a bit messy after surgery. 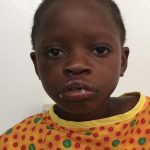 She had never been able to use her upper lip to get food off of her spoon, and she was learning how everything works with her new, intact lip. Her ability to eat and talk will improve significantly as she heals. After surgery, I went to the family waiting room with Anna Koppel, RN, to bring Catherine’s aunt to the recovery room. When we called Catherine’s name, her aunt jumped up and practically danced to the door. 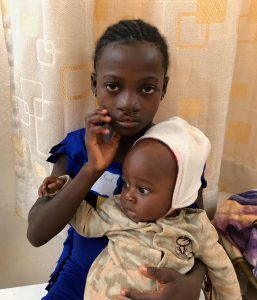 As we made our way back to recovery, she exclaimed that Catherine would now be able to attend school. 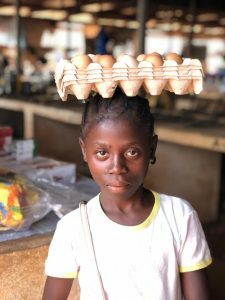 She related that when Catherine was with other kids in her village, they would stand in a circle around her and simply stare. 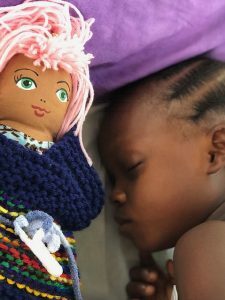 Catherine’s aunt had heard that CSI was coming to Liberia and was determined to give Catherine this chance at a better life. 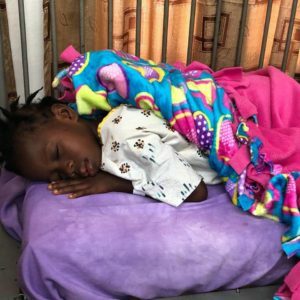 She rode her scooter an hour into the bush to get Catherine and then another four hours to Firestone Duside Hospital. 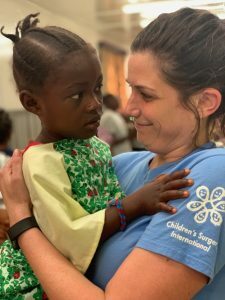 I’ll end by acknowledging with thanks the work that CSI does to make such miracles happen, and for the gifts of people like Dr. Brianne Roby, Catherine’s surgeon. See more photos from our trip here.